The Weather Guy: Can You Believe It Is July? Can You Believe It Is July? Chilly tonight folks. Hard to believe it is July 16th. 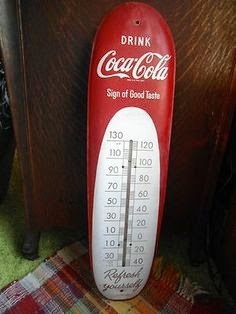 Just for fun a 1950's thermometer. Record low for the overnight is 50° in 1945. Historically the second to third week of July is one of our hotter weeks of the summer. Don't get used to the cool weather. We'll heat right up again to the mid 80's by Sunday with upper 80's Monday, Tuesday, and Wednesday. There will be thunderstorm chances starting on Friday afternoon all the way through Wednesday. The full forecast link is below. Do you think we've been wet, dry, or about normal. The result may just surprise you. Here is the 3 month outlook for August through October. If you're looking for an early autumn then you'll be unhappy about the outlook!